A manned space capsule of the The Shenzhou-9 mission is scheduled to dock with the nation's orbiting Tiangong-1 space lab for the first time next week on June 16th. "The fact that China is going it alone here is significant," says Roger Launius, a historian at the Smithsonian Institution's National Air and Space Museum in Washington DC. 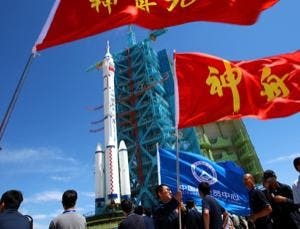 "It gains critical experience for China in long-duration missions, rendezvous and docking– something it must do to close the gap between it and the other spacefaring nations." A capsule carrying three taikonauts, including include China's first female taikonaut, will launch atop a Long March-2F rocket (image above) from the Jiuquan Satellite Launch Center in north-west China. Two days later, the aim is to dock with Tiangong-1 ("Heavenly Palace") – a 10-metre long, 3-metre diameter space lab launched in September last year.